Each year, more than 440,000 people volunteer for the National Park Service (NPS). 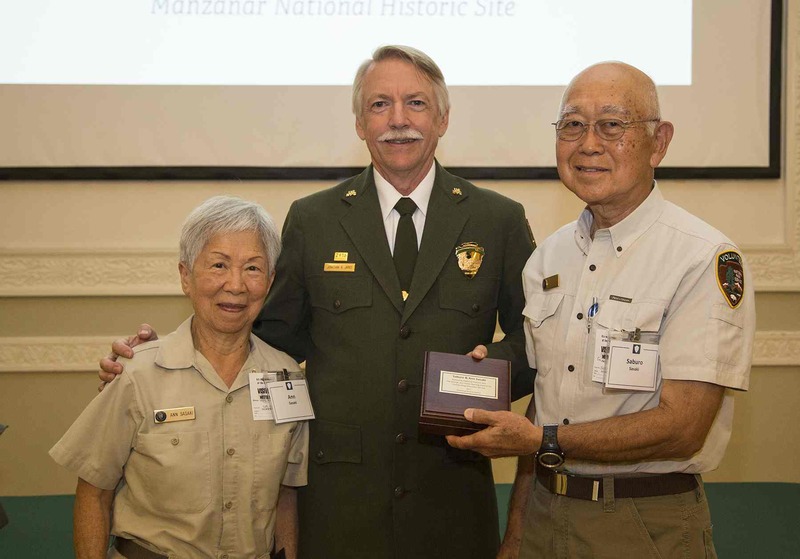 This year, from among them, the NPS recognized Manzanar Volunteers Saburo and Ann Sasaki with the prestigious Hartzog Enduring Service Award. NPS Director Jon Jarvis presented the award on Aug. 9 in Washington, D.C. Manzanar Superintendent Bernadette Johnson and Volunteer Coordinator Carrie Andresen joined the couple for the ceremony. Since 2005, the Sasakis have volunteered at Manzanar between mid-April and mid-June. Saburo spends most of his time talking with visitors, answering questions, and presenting interpretive and educational programs for up to 1500 people each year. Ann staffs the Visitor Center, assists with Manzanar History Association operations, and has completed dozens of major projects for Manzanar’s library, museum, archives, oral history, and photo collections. Together, they have volunteered more than 3,000 hours. They also present programs around the country. “Saburo and Ann’s volunteer efforts are remarkable and I hope they inspire others. Each spring, Sab is requested by many teachers to share his personal stories of life in Manzanar with their students,” said Johnson. In April 1942, Saburo was a 7-year-old farm boy in San Fernando when the U.S. Army uprooted his family. For three years and seven months, the Sasakis — Family #3831 — were among more than 11,000 Japanese Americans exiled to Manzanar. Saburo attended second, third, and fourth grades in the camp. The Sasakis left Manzanar in October 1945 for Cleveland, Ohio. Saburo later met Ann in Cleveland. They both went on to become engineers for General Motors. Today, they travel 2,250 miles each way to Manzanar from their home in Rochester Hills, Mich. While the distance is impressive, what is most exceptional is Saburo’s seven-decade journey from a childhood in Manzanar to serving as a National Park Service volunteer. As a Chinese American woman, Ann has the unique burden of interpreting history she is presumed to have endured in Manzanar. As she says, “The story is not just worth telling, it must be told.” Both Saburo and Ann make history come alive for every visitor they encounter. This year bridges the celebratory 100th anniversary of the National Park Service and the eve of the somber 75th anniversary (2017) of Japanese Americans being removed from their homes and communities. The Manzanar staff nominated the Sasakis for the Enduring Service Award because there is no more fitting time to recognize two exceptional volunteers whose lives bridge these two contrasting milestones in U.S. history. Saburo and Ann hope that one day their children and grandchildren will carry on their volunteer service at Manzanar. Manzanar is located at 5001 Hwy. 395, six miles south of Independence. For more information, call (760) 878-2194, ext. 3310 or go online to www.nps.gov/manz or www.facebook.com/ManzanarNationalHistoricSite.